This may have been the best, and longest, 200 miles so far! We have created an art of stretching out our time in order to be here longer! 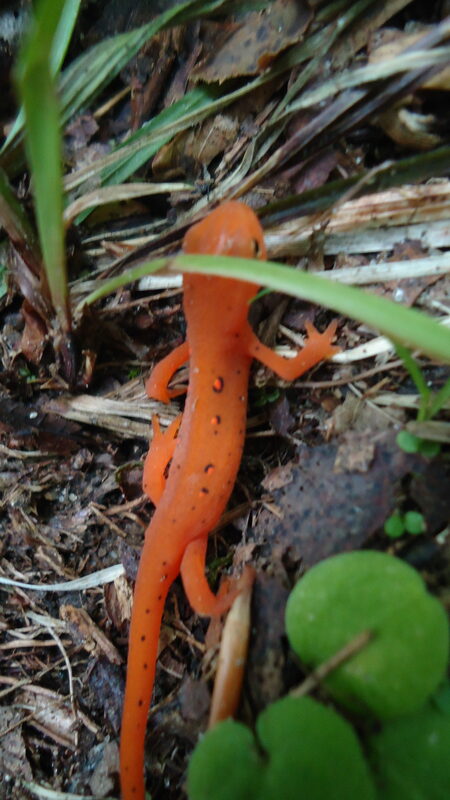 From Rutland, we hiked through Gifford Woods State Park to Killington, up Quimby Mt, and down to several streams. The Lookout Cabin had great sunrise views from the rooftop. The next section is full of ups and downs with several opportunities to pop into small towns or marketplaces. 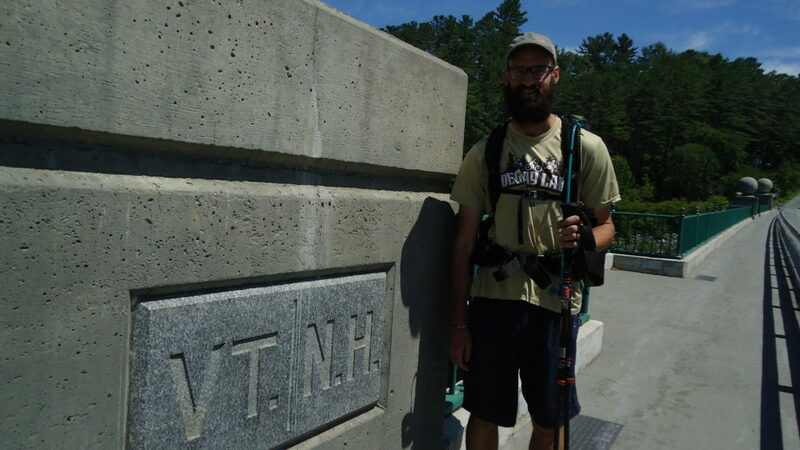 As we crossed the Connecticut River, we said goodbye to Vermont & hello to our 13th state, New Hampshire! Hanover is home to Dartmouth College and the whole town is an interesting mix of ivy league students and hiker trash. Tons of free stuff/resources for hikers. Next, we climbed Moose Stand enjoyed precipitous drop-off views from Holt’s Ledge. Lambert Ridge is made of quartzite and offered us excellent sunset views. 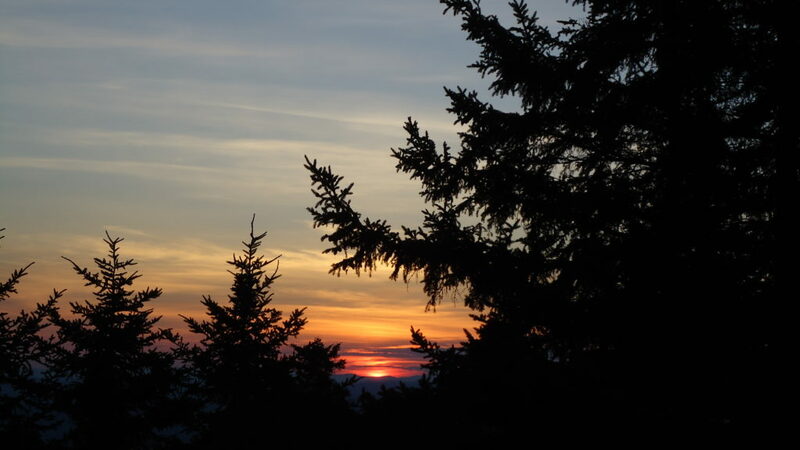 We went up in a fire tower on Smarts Mt and earned our views on Eastman Ledges and Mt Cube. Mt Mist was the last peak before hitting Glencliff, the unofficial start of the White Mountains. 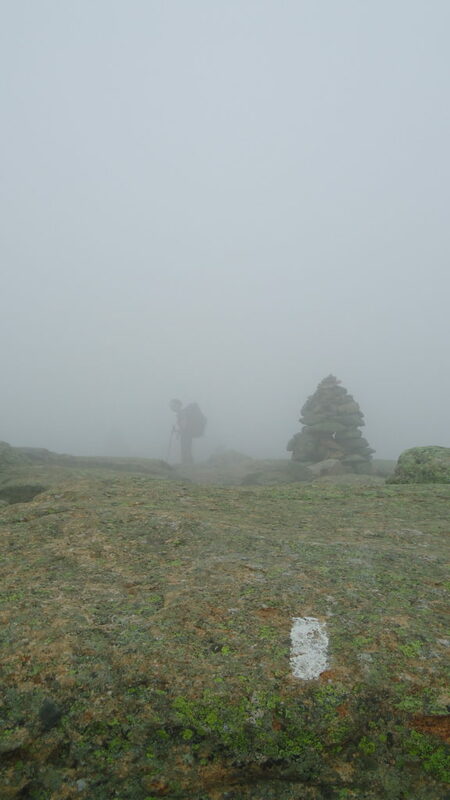 Mt Moosilauke was the first challenge with 3,500 ft elevation gain over 4.5 miles. It is achievable and the views were breath taking. The descent follows Beaver Brook, a series of waterfalls for 2,000 ft over just 1.5 miles. Shortly after, we crossed 1,800 miles at the Dilly Cliff Trail. Mt Wolf was a nice lunch spot and then back down to Eliza Brook. The AT parallels it upward for nearly a mile and then keeps going up the extremely challenging Mt Kinsman (South & North). We were relieved to see the tent platforms and pond shortly after the summit. We passed by the first hut, Lonesome Lake Hut, set on a pristine lake in the woods. Surprisingly, we did go under I-93, which divides the forest. Quickly, the noise was gone as we headed up Liberty Mountain and then Little Haystack Mountain. From there, we remained above treeline for 2 miles over Mt Lincoln, Mt Lafayette and Mt Garfield on a section known as the Franconia Ridge. 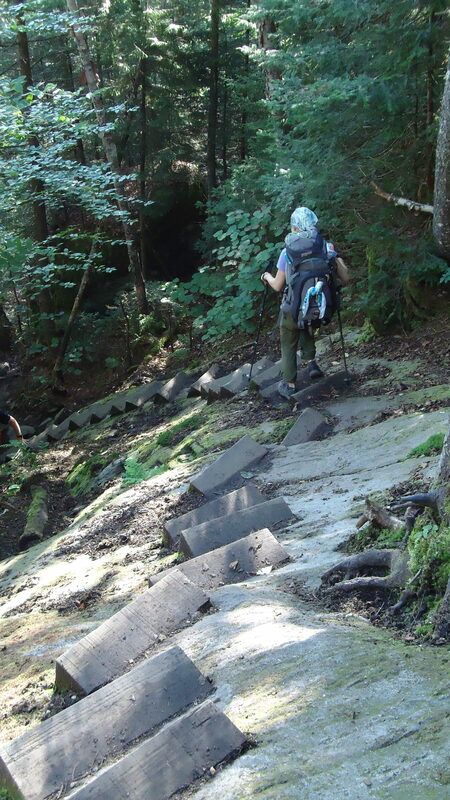 The trail descends to Galehead Hut before a steep 1,100 ft climb in <1 mile to South Twin Mt and Mt Guyout. We enjoyed views from Zeacliff, where the only man-made thing in sight is a distant ski slope. Zealand Falls Hut stands at the top of a large waterfall. From there, it is a pleasant walk to Ethan Pond and down into Crawford Notch past the Saco River. The Presidential Range is supposed to be spectacular but we missed all the views due to weather. We were above treeline for over 20 miles over the Webster Cliffs, Mt Webster, Mt Jackson, Mt Pierce, Mt Eisenhower, Mt Franklin, Mt Monroe, and of course, Mt Washington. By the time we got to Madison Hut, the skies cleared! Excellent views from Mt Madison and the following ridge. It’s all downhill to Pinkham Notch. Wildcat peaks E, D, C, & A were substantial challenges. Carter Notch Hut is the last for NOBOs at mile 1,875. The trail climbs Carter Dome, Mt High, Carter Middle, Carter North, and Mt Moriah before dipping into the Rattle River. Gorham, NH marks the North end of the Whites. Mt Hayes and Cascade Mountain were next. Page Pond, Wicket Ledge, and Dream Lake finished out 1,900 miles! Bagels came out for her 3rd visit! This time we were beyond the reach of trains out of NYC, so she rented a car to come get us. 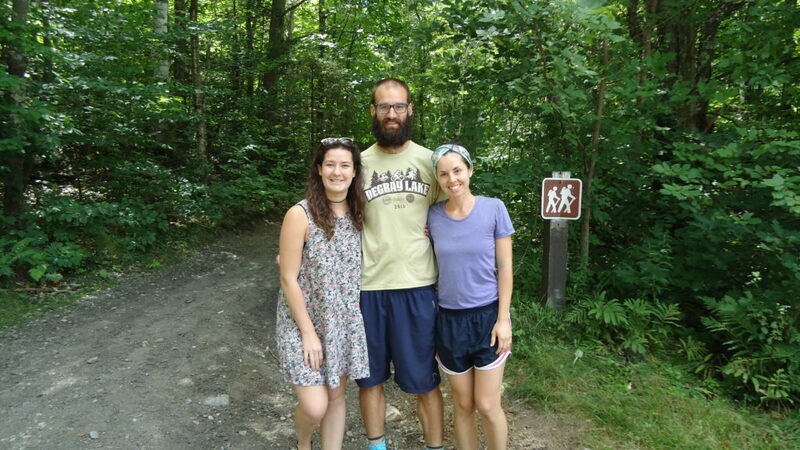 She met us at Hikers Welcome Hostel and whisked us away to an Airbnb she rented for us. We enjoyed the hot tub, a homemade meal, and all fell asleep watching a movie. The next day we started the Whites, so this was a perfect time to rest up. 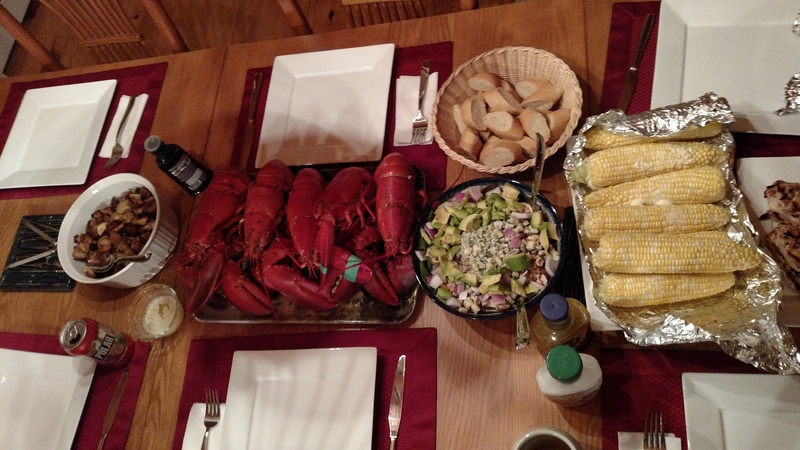 Uncle David & Aunt Alice live in Boston but have a fabulous place in Maine on Lake Kezar. We were fortunate enough to visit twice during this stretch of trail! Our time on the lake was well spent between swimming, kayaking, boogey boarding, and even snorkeling! It’s crystal clear waters were very refreshing. The food was incredible and we had our first lobster rolls. In the evenings, we binged on prime time Olympics. Swimming and gymnastics are so fun to watch! Go Team USA! Our second visit was a bit of a surprise- Uncle Mike texted saying that he, Aunt Debbie, and the girls were driving up to Maine for the weekend. In a split decision, we got off the trail and went back to Lake Kezar for family time. Reese just got back from 7 weeks of sleep-away camp so we had missed her back in NJ. Side trip to Kezar Lake, ME with Uncle Dave & Aunt Alice. We enjoyed our first lobster rolls at Beth’s Kitchen Cafe! I’m sold! Lobster dinner with the Carberry crew! New Hampshire is everyone’s favorite place to visit! 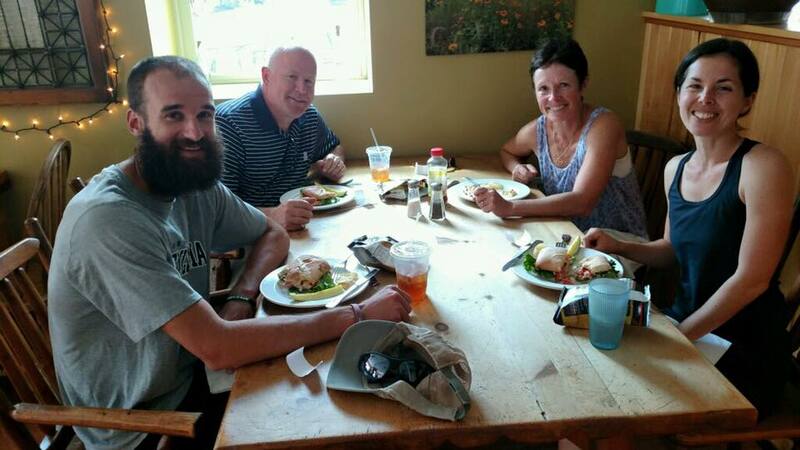 Claudia’s cousin, Heidi, and her family went to North Conway for vacation and were able to meet up with us again! After a crazy long day of hiking, we arrived at Pinkham Notch to find a dead zone for cell phones. We were directed to the pay phone downstairs. (Didn’t know they still existed!) When Heidi & Harrison (3 years old) found us around 9 pm we went directly to DQ for blizzards, sandwiches, and fries. After a good night’s sleep we got up and slack packed Wildcat, which has the reputation for being very difficult. The first mile, Andrew, Claudia, Heidi & Ryan (with Baby Claudia in a pack) and Harrison completed together. As soon as we hit the trail Harrison asked, “Can I run? !” We said, “Sure…” and he took off! It seems he is a natural trail runner! Ryan took the kids back and we continued on with Heidi. Wildcat was hand over hand scrambling with views of Mt Washington from time to time. I would not have wanted to do it with my pack and poles. As a day hike it was really fun and we met the Ryan & the kids on top via the summer gondola. We took it back down and went to “Fat Biscuit” for a filling Southern style meal. The following day, we were all set to take the gondola back up with our packs. What an ingenious slack packing plan, right?! Wrong… due to the wind speeds, the gondola was delayed, delayed, and closed for the day. At nearly noon we strapped on our packs and made another 3 mile trek up Wildcat, this time using the easier, but still steep, ski mountain road to the top, in the rain. Let me take a moment to explain “The Whites.” Of all the AT rumors, build up, and hype, the Whites take the cake. People have been talking about the Whites for probably 500 miles. By the time we arrived, we were so confused about the rules and system that we didn’t know what to expect. The White Mountains are public lands but run by the Appalachian Mountain Club (AMC). Thru-hikers jokingly refer to it as the Appalachian “Money” Club because of how expensive their services are, especially on a thru-hiker budget. Their “hut” system has been in service for 125 years and costs somewhere around $125 per person per night for a bunk, dinner, and breakfast. Campsites are also pricey at $10 per person per night for essentially the same thing that we’ve had for free the past 4 months. Stealth camping is allowed unless posted otherwise (not allowed above tree line or within 1/2 mile of a hut). What makes the AMC awesome is that they are able to bring thousands of people (thru-hikers are only 5% of their customers) out to some of the most scenic and rugged stretches of mountains in America while still conserving the wilderness. In many aspects, we have come to believe they are doing a better job of this than the National Park Service. Everything is done on foot— there is no driving option in the Whites. There isn’t a loop road connecting all of the huts. You have to walk there! What makes it expensive is that they hire care takers at all of the campsites and maintain staff and supplies at each hut. The staff each carries 50-90 pounds of food twice per week and they air lift non-perishable food and supplies in several times per year. The human waste that isn’t composted is also airlifted out at the end of the season. So… at the end of the day, we are fans of the AMC and think they’re doing a great job! Thru-hikers and the huts have a symbiotic relationship- we want food and lodging and they don’t want to pack out leftovers. As a result, they offer work-for-stay (WFS) in which hikers can work for 45-120 minutes and receive as much leftover food as one can eat. It also includes a nice dry spot on the dining room floor for the night and coffee in the morning. If you don’t mind waiting, you can also choose to stay for breakfast and do another chore to earn more food. We ended up doing 3 WFS- Greenleaf Hut, Mizpah Hut, and Lake of the Clouds Hut. We also did a sporadic work-for-food at Carter Hut (not because we didn’t have food but because theirs is delicious and already prepared). 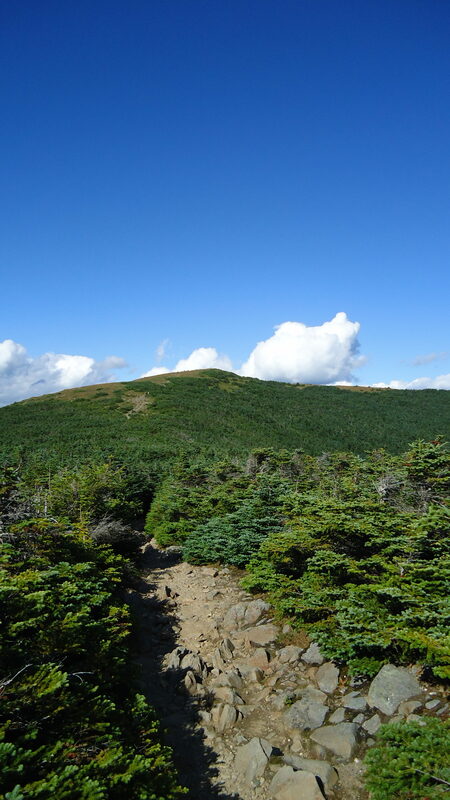 Mount Washington is one of the most challenging mountains of the AT. At 6,288 ft it is known as having the “worst weather in America.” We were planning to summit on 8/14/16. We awoke to high winds, low visibility, and a chance of severe thunderstorms (above tree line). After hiking <6 miles we made it to Lake of the Clouds by noon. They advised us that they have experienced hypothermia in conditions such as these and offered us WFS. When they mentioned they were serving stuffed shells and garlic bread for dinner, we were in! 12 hikers in all waited until 8/15/16 to go up and over. Even with the wait, we still experienced 40-50 mph winds and a wind chill temp of 35 with 50 ft visibility. We grouped up with another hiker to summit for safety. It was an experience we will never forget! At the top we visited the weather museum and took a few photos in the thick fog. Coming down was equally difficult and we added 2 other hikers to our group. The 5 of us hiked single file for most of the day and guided one another’s footsteps. Our first rays of sunshine appeared as we descended to Madison Hut. Claudia hollered with joy and did a little dance to celebrate! From Madison onward, the sunshine was ours! Do you know where maple syrup comes from? Vermont! Trees! 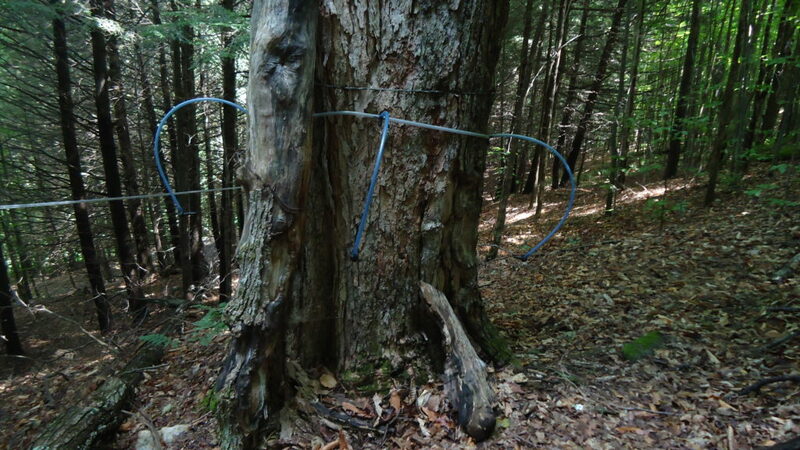 It is not the season so we didn’t see it in action but there are many acres of trees/tubing along the AT. 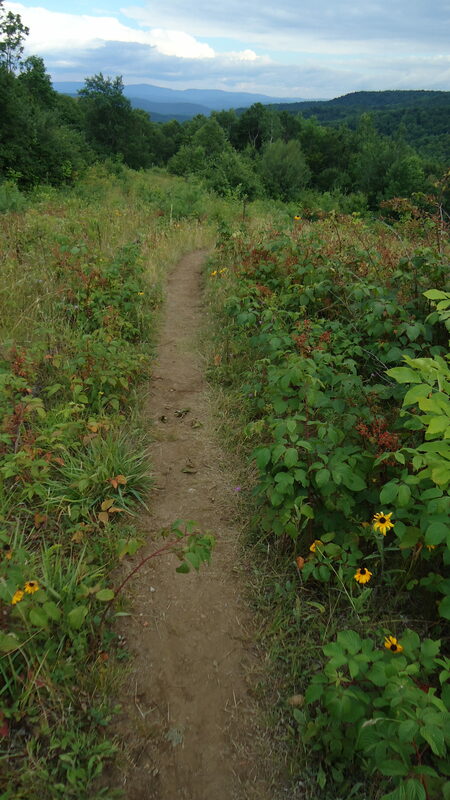 Ridge top covered in blackberries, raspberries, and black eyed Susans. Crafty trail work makes the steep descent down Beaver Creek more manageable. The AT descends nearly 2000 ft in 1.5 miles. View of Mt Moosilauke from the South Peak of Moosilauke— finally back in the mountains! 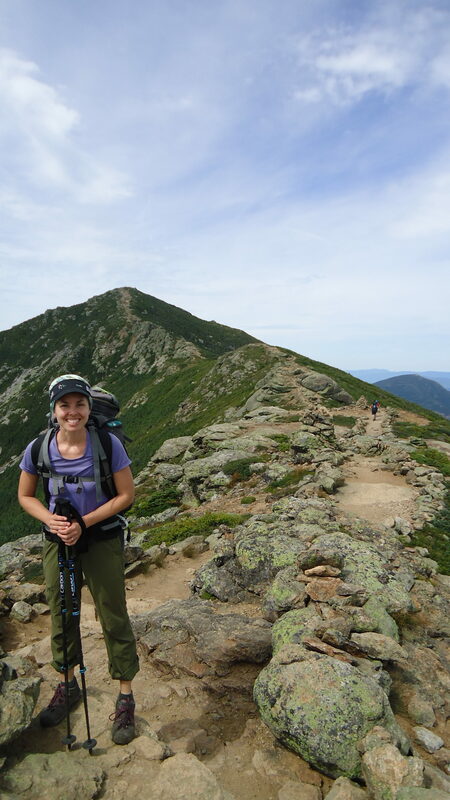 After staying at Greenleaf Hut, we headed back up to the Franconia Ridge to meet the AT. What a difference a day makes- the previous day we had 100 mile visibility and the following day we could only see 50 feet! It was difficult to see the blazes but the giant cairns (piles of rocks) can be spotted from a distance. MOOSE! While camped at Dream Lake we saw a moose wade out to drink at sunset. He was quite a distance away but we could still see his massive body and head distinctly. We watched him all evening and were pleased to see him back in the morning at sunrise. Mountain Meadows Lodge had the best hiker box! It is on the trail right before Killington. 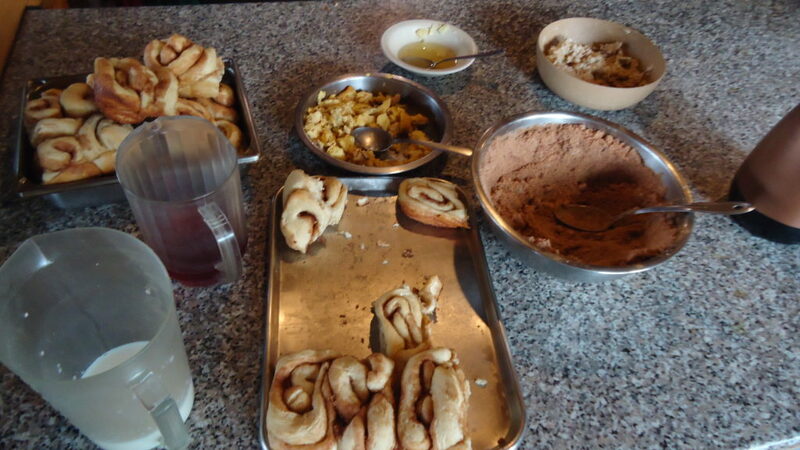 It was loaded with snack foods, large deli style cookies, toiletries, etc. It’s a popular place for people to go for the weekend… I guess they pack too much food and then leave it behind! “The Lookout” is a privately owned cabin but allows thru hikers to stay for free! Fireplace and rooftop patio! (Mile 1718) Please be respectful and follow any posted rules. They have been doing this since 1998 so let’s keep it going! Hanover, NH is worth spending an afternoon or more. There’s no where for hikers to stay in town but there is a list of trail angels at the trail head. Some of them allow overnight guests. The Dartmouth Outdoor Club has a building 100 yards from the trail. You can stash your pack there and use their computers 24/7. Lou’s gives free donuts and there is free pizza too (listed in guide book). There is even a movie theatre on the trail. The matinee is $7.50. Expect to do lower mileage in the Whites. 8-12 miles per day is a good goal. Often, we only hiked 1-1.25 miles per hour during this section. Greenleaf Hut was our favorite WFS. 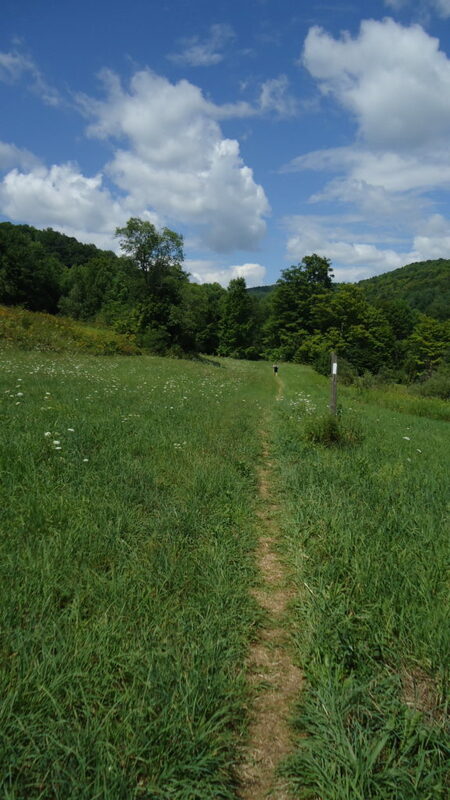 It is 1.1 miles off the AT but it is all exposed ridgeline coming down from Mt. Lafayette. It was a really beautiful spot and the Croo was very generous. Franconia Ridge is one of the most beautiful places either of us has ever been. Definitely makes the Top 10 list. Moving right along! The Connecticut River divides VT/NH right before Dartmouth. Wow! Bagels is amazing! And how wonderful that you got to spend quality time with Uncle Dave and Aunt Alice and Heidi and crew! Y’all are living the dream. So glad you are soaking it all so well and documenting the ride for all of us. 🙂 Sending you a squeeeeeeze from the Natural State. Love reading what you guys are experiencing. Thanks for sharing. Claudia, I’m a Smithton resident. I worked with your mom some at the grade school years ago. I work with seniors at a health club in Belleville, IL where I organize luncheons with speakers. I was wondering if when you get back you & your husband would be willing to come & share your experience with my group? There’s a free potluck lunch involved! My work number is 618-398-2778. You can leave a message. Hope to hear from you!! Hey you two are doing great. I really was not aware that I had ever been up on AT, but since CARTER is up there maybe I was in my previous life. Hi Claudia and Andrew, great update – I’m enjoying the details of your trip and the pictures. Enjoy the Maine wilderness – you’ve earned every bit of it! The adventure continues. It’s hard to imagine how far You have gone. Your blog makes for great reading. Sounds like You are having a great time. Glad to hear You saw a moose. Andrew and Claudia, I have been so impressed with the progress you’ve made and your sheer tenacity through every trial and obstacle. Your stories are incredible! Your ERT family is proud of you. You both look great. Andrew, you’ll just need to die your beard white in December and you’ll have a job! 🙂 Meanwhile, keeping you in prayer! Love the Whites and reading your about your adventures on them. Keep up the good work, you’re almost there! Hey, you two…I admit I’m starting to get a little uneasy with the long silence here. Your posts generally average a week or two apart with the last one being 3 weeks apart, but now it’s been almost a month since your last post (or will be on Monday). Are you two OK? The last post I see is this one for Miles 1700-1900 on Aug 24th. (tap tap tap) Is this thing working? 😉 Eagerly awaiting an update! Hey Joyce! We are fine; we finished the trail on Sept 10th! We’ve been visiting family in the Northeast the past few weeks. We are working on the last 2 blog posts. Maine is very remote, and we wanted to soak in the last few weeks of the trail, so we didn’t do any writing in that stretch. Congrats on finishing the whole thing!! I’m so impressed and proud of you two! That is beyond awesome. Thanks for letting me know you’re OK. Thank you!!! Hopefully you saw the update today and we’ll have 1 more soon! Thanks for thinking and praying for us throughout our journey.